SM7THS Blog: Rebuild in progress. 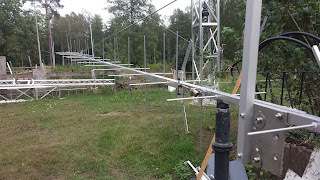 Have added vertical elements on 4 antennas now and it is clear that it does not impact the horisontal part regarding matching at all. Measured all 4 Before and after adding the vertical elements and no difference was seen. Put a vertical dipole on one of the antennas but will do a rebuild of the dipole mechanics as it has been a weak spot earlier using RG142 so will try to get some bulkheads for RG401 .250 semi rigid. Needed to add a support for the support wires to the upper antennas and I did the support wires to evaluate and it looks good but I will need some support structure in the front and will order 15mm. fiberglass tubes. A bit tricky to assemble the 4mm Bayco wire in the cringles and wire locks trying to make 4 support wires the same length. 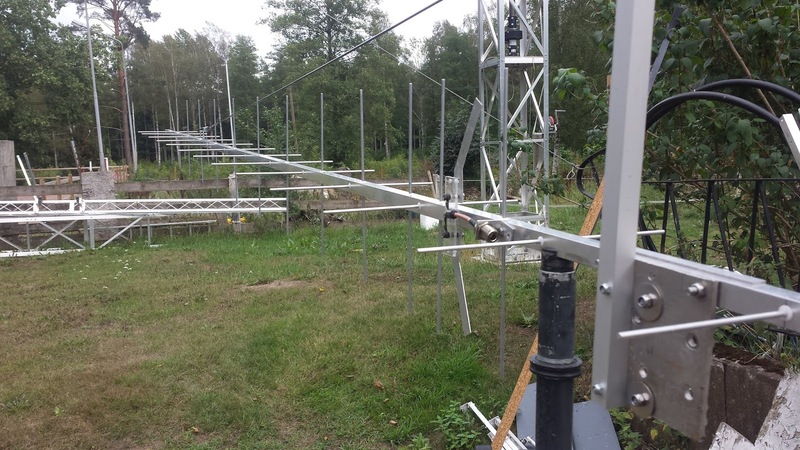 Will continue this week with the remaining 4 antennas and and test a different mechanical dipole carrier.